The United Center, home of the Chicago Bulls and the Chicago Blackhawks, is a 900,000-square-foot indoor sports arena and entertainment facility. Located one mile west of Kennedy Expressway and the Loop in Chicago, the stadium is well-known for hosting entertainment such as World Wrestling Entertainment events and concerts, in addition to NBA and NHL games, and the Michael Jordan statue outside the facility is an attraction in its own right. U2, Bruce Springsteen, and the Rolling Stones have all performed here, and the United Center is a great venue for enjoying these concerts and other events of all kind. If an event here is the main reason for their trip to Chicago, visitors can book hotels near United Center to ensure they have no trouble reaching their seats on time. Chicago is a great city for sports, and the United Center promises the same kind of fun and entertaining experience fans would find at famous venues such as Wrigley Field and Soldier Field. The construction of this privately-owned state-of-the-art indoor stadium began in April 1992, the facility was inaugurated on August 18, 1994. The aim was to build an indoor sports complex that would take entertainment and sports into the 21st century; the idea for a newly sophisticated indoor arena was first initiated by William Wirtz and Jerry Reinsdorf, the owners of Chicago Blackhawks and Chicago Bulls, respectively. Since its opening in 1994, United Center has hosted more than 200 sports and entertainment events each year, including more than 80 Bulls and Blackhawks games and events such as the men's NCAA basketball tournament, in addition to shows by music legends including Paul McCartney, Aerosmith, and Eric Clapton. One of the most impressive features of the state-of-the-art United Center is its recently renovated concourse, which more than 140 flat-screen televisions. The United Center seating arrangement is equally impressive, with three different seating levels for spectators (lower, club, and upper) and areas close to the concession stands for easy access to food and beverages during events. For instance, the new concession stand and seating area in section 326 provides a wonderful backstage ambience for tourists and fans. In addition, Individuals who have purchased United Center tickets on the 100 level can also get a membership to the Ketel One Club for a more private viewing experience. The club is located in section 119 and offers a wide range of services, including dining options offering filet mignon. Fans of the Blackhawks and Bulls can also purchase exclusive team and player merchandise at the Fandemonium, the United Center's souvenir and gift shop. Although the arena is large in overall area, the seating capacity is not the largest when compared to other venues. It seats around 20,000 for basketball, 23,000 for concerts, and 20,500 for the NHL tournaments. However, the quality of the views and new concession stands nearby mean that there isn't really a bad seat in the house. Fans can purchase United Center tickets in person at the Gate 4 box office at game time or ahead of time if you're concerned about the event selling out. There is no need to buy United Center tickets for kids who are less than 3 feet tall, and the arena can be easily accessible by the disabled. Guests with disabilities are also allowed to bring certified service animals into the United Center if they need to. If you are looking for hotels near United Center, there are plenty of options. 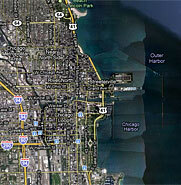 For instance, the Chicago Marriott Hotel in Harrison Street is less than a mile away from the facility. There are also budget hotels within a few miles, including the TraveLodge, which was built in 1928 and is one of the city's older hotels. The hotel is strategically located to give easy access to McCormick Place, Millennium Park, Grant Park, and Navy Pier in addition to the United Center, making it easy to see the city's major attractions in addition to attending your sporting event or concert. The array of hotels near United Center also means that whether you're seeking budget or luxury accommodations, you should have no trouble finding options to suit you.